Researchers at the Polytechnic Institute of New York University in the U.S. and the Instituto Superiore di Sanitá in Italy have created a robotic zebrafish that can mix with real zebrafish and influence their behavior. The robot visually resembles an actual zebrafish. It is roughly 15 centimetres long and spray-painted with the zebrafish’ characteristic blue stripe pattern. 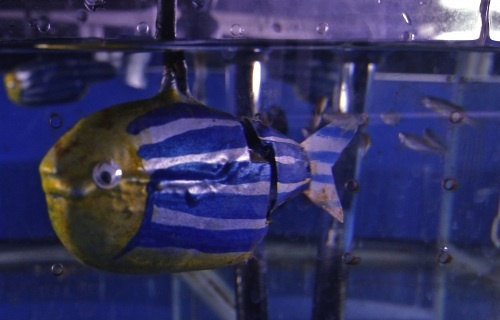 To influence fish behavior, the researchers controlled the robot’s tail motion to mimic that of real fish. This new research builds on past projects for mixed robot-animal societies which has tackled chickens and cockroaches. Such mixed societies add a powerful new experimental option to the toolbox of behavioral biologists to understand social interactions between animals, which are usually very difficult to understand by observation alone.